ALERT : The Lift CLI has embedded capability to auto-update the client when new features are introduced or fixes are required. IBM is completing the work to rebrand Bluemix to IBM Cloud. Infrastructure changes were made to our service which requires our customers to download and install a fresh instance of Lift for the auto-update function to continue working. Users will also get a message in their CLI when this update is required. Want to help improve our product? Check out our Idea Portal. For more general feedback, use the form below. Unable to send feedback at this time. Please try again later. Lift uses IBM Aspera under the covers to move your data to the cloud at blazing fast speeds. Lift uses Aspera's patented transport technology that leverages existing WAN infrastructure and commodity hardware to achieve speeds that are hundreds of times faster than FTP and HTTP. For Db2 sources, Lift CLI now lets you create several database objects (including tables) in a target database with a single command. Specify, in the command, a series of object names, or use wildcards to apply the command to all objects with names that match the specified pattern. This can be done for tables, indexes, views, sequences, procedures, functions, aliases, auditpolicies, and triggers. For more information, see the Command Reference and FAQ sections of the Lift CLI documentation. Hover over each item for more information. Your fully-managed data warehouse in the cloud. The 'load' command ingests the data from the landing zone into the Db2 Warehouse on Cloud engine. The 'ls' command lists the files in the cloud landing zone. The 'df' command shows the available disk space in the cloud landing zone. The 'rm' command removes a file from the cloud landing zone. The 'put' command moves the file from your local disk to the Db2 Warehouse on Cloud landing zone: a space for staging data before ingest. The flat file containing the data from a single table in your source database. The 'extract' command allows you to extract data, as flat files, from your database to your local machine. The source of data you want to move to the IBM Cloud. Want to migrate from IBM PureData System for Analytics to IBM Db2 Warehouse on Cloud? It's a two-step process: convert your schema and migrate your data. To convert your schema, start by downloading the IBM Database Conversion Workbench . The workbench will walk you through the process of converting your source database DDL so that it is compatible with the target. The workbench will also produce a report that tells you where your action is required. Once your schema is in place, you'll use the Lift CLI to migrate your data. You need to keep feeding your warehouse with new data constantly, and the Lift CLI is here to help. Don't slam your transactional data store with reporting queries. Your customers don't care that you need to run analytics on their buying behavior. They just want a snappy user experience. Spin up a cloud data warehouse, such as IBM Db2 Warehouse on Cloud to run analytics on data from your transactional data store. Keep your reports and dashboards up to date by sending small amounts of data from the source, and always have an up-to-date view of your business. Disk - 250 MB for the Lift CLI. Additional disk space is recommended for data extraction. Refer to the FAQs for more guidance on disk space requirements for data extractions. You must sign up for an IBM Cloud account that creates an IBMid if you don't already have one. Use your IBMid to log in to IBM Cloud before you can download IBM Lift CLI. The IBM Database Conversion Workbench helps you migrate your source schema to IBM Db2 Warehouse on Cloud. It will examine your source DDL and automatically convert it to make the DDL compatible with your target engine. If the Database Conversion Workbench can't convert something automatically, you'll get a report detailing the steps you'll need to take to complete the conversion. Unable to load software license at this time. Please try again later. Download the version of the Lift CLI for your operating system. Unzip the package to a <zip-extract-directory> directory on your hard drive. The lift command executable is located in the <lift-home>/bin. After the installation completes, add the <lift-home>/bin to your PATH environment variable. For the rest of this tutorial, we assume that <lift-home>/bin is in your PATH and that the lift command is accessible from your terminal. The following sample data set can be used to complete the tutorial or you can use your own data file and DDL.Download the Download the Boston Property Assessment FY2016 (45.6MB) sample data set (courtesy of Analyze Boston). This package contains a schema (boston_property_assessment_fy2016.schema.sql) file and a data file (BOSTON_PROPERTY_ASSESSMENT_FY2016.csv). Log in to your Db2 Warehouse on Cloud or Db2 on Cloud console. Copy the contents of boston_property_assessment_fy2016.schema.sql into the DDL box under the Run SQL tab. Specify a schema by concatenating the schema name with the table name separated by a period. For example, <SCHEMA_NAME>.BOSTON_PROPERTY_ASSESSMENT_FY2016. If a schema is not specified, the table is created in your default schema. The default schema name is your user name in uppercase. Click Run All. The result is a table called BOSTON_PROPERTY_ASSESSMENT_FY2016 in the specified or default schema. Move the data file to the Db2 Warehouse on Cloud or Db2 on Cloud landing zone. This landing zone stages your CSV file before it's ingested into the database. You need your database credentials. You can get these credentials from the console by clicking Connect in the side navigation bar. The `--header-row` option specifies that the first row of the data set contains the column headings. The `--file-origin` user option specifies that this CSV file is user-generated and was not extracted using the lift extract command. You're done. You can now run SQL queries on the sample data set from the database console. Create the schema and table structures on your Db2 Warehouse on Cloud database target. You have several options to do this, but the most effective way is to download, install, and use the download and use the IBM Database Conversion Workbench. This tool can help you to convert your existing Netezza schema to one that's compatible with the Db2 Warehouse on Cloud engine database. After completing the conversion, the DCW produces a report that identifies which parts of your source database DDL were automatically converted and which parts require manual intervention. For more information, see the included step-by-step DCW guide. The `--file-origin extract-pda` option specifies that the CSV file was extracted by using the lift extract command. You're done. You can now run SQL queries on your data from the database console. Create the table structures on your Db2 Warehouse on Cloud or Db2 on Cloud database target. 2. Execute the generated DDL. Use this method if you want to customize the DDL extracted from the source database. Run the lift ddl --help command for more available command options. After your table structures are in place on the target database, you can start moving your tables. Start by extracting a table to a CSV file. Move that file over the network, stage it in the landing zone of the target database, and then load it into the database. Extract the table to a CSV file by running the following lift extract command:. The `ias, db2, and db2w` settings for the `–source-database-type` command option are used to specify the particular source database type. The native mode of the lift extract command leverages Oracle's native tools for extraction and is recommended for the best performance. If Oracle client tools cannot be installed or configured properly, Lift CLI automatically switches to JDBC mode that has relatively slower performance. For best performance, use Oracle client tools (Basic and Tools packages) that provide native extract tooling. Install and configure the Oracle client on the same box as Lift CLI and set the client path in the system environment variable so that Lift CLI can find and use it. The native mode extract method uses server encoding irrespective of the encoding on the client machine. If the table name or column names contain multi byte character set (MBCS) characters, then the encoding of the client must match the encoding of the server so that the table and column names can be specified properly in the Lift CLI commands. IBM Database Conversion Workbench (DCW). This tool can help you to convert your existing Oracle schema to one that's compatible with the Db2 Warehouse on Cloudor Db2 on Cloud engine database. After completing the conversion, the DCW produces a report that identifies which parts of your source DDL were automatically converted and which parts require manual intervention. For more information, see the included step-by-step DCW guide. After your table structures are in place, you can start moving your Oracle tables. Start by extracting a table to a CSV file. Move that file over the network, stage it in the landing zone on Db2 Warehouse on Cloud or on Db2 on Cloud, and then load it into the database. The `--file-origin extract-oracle` option specifies that the CSV file was extracted by using the lift extract command. Optionally, you can move indexes and other constraints from the source database to the target database after completing the data movement. Create the schema and table structures on your IBM Cloud target database (Db2 Warehouse on Cloud or Db2 on Cloud). After your table structures are in place, you can start moving your Microsoft SQL Server tables. Start by extracting a table to a CSV file. Move that file over the network, stage it in the landing zone on Db2 Warehouse on Cloud or on Db2 on Cloud, and then load it into the database. The `--file-origin extract-sqlserver` option specifies that the CSV file was extracted by using the lift extract command. Unable to fetch command reference at this time. Please try again later. How does the Lift CLI migrate my data to Db2 Warehouse on Cloud? If you're migrating data from your IBM PureData System for Analytics (Netezza) database, you will first need to locally extract a database table to a CSV file using `lift extract`. Then, you will transfer your CSV data file to the IBM Db2 Warehouse on Cloud landing zone using `lift put`. 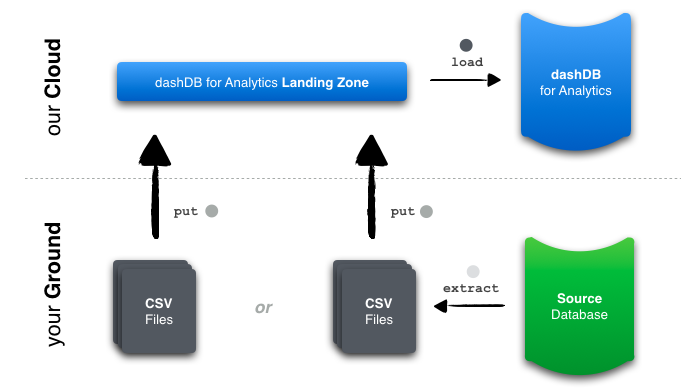 The IBM Db2 Warehouse on Cloud landing zone is a pre-allocated volume used for data loading & scratch. Finally, you will load the uploaded CSV data file into the engine using `lift load`. Once the load is complete, you can delete the data file using `lift rm`. If you're migrating a set of CSV files, you'll follow a similar set of steps to above. You'll start by transferring your CSV data files to the Db2 Warehouse on Cloud landing zone using `lift put`. The Db2 Warehouse on Cloud landing zone is a pre-allocated volume used for data loading & scratch. Finally, you will load the uploaded CSV data file into the engine using `lift load`. Once the load is complete, you can delete the data file using `lift rm`. Is there a maximum database size that I can migrate? No, you can migrate any size database. But, keep in mind that the duration of your database migration depends on your network connection speed, the volume of uncompressed data that you need to move, and the hardware profiles of your source and target computers. In other words, mileage may vary. What database artifacts can I migrate? The Lift CLI will migrate your tables or CSV files to an IBM Cloud data target. If you need to migrate other database artifacts, such as tables, views, stored procedures, please use the IBM Database Conversion Workbench (see section above). Where should I install the CLI package for best performance? We recommend that you install and run the CLI from a machine that is network-close (minimal latency) to your database source. This will ensure that your data is extracted and staged faster in your on-premises environment, thus improves your overall end-to-end data migration time. What network ports must be open on my on-premises system? What are the on-premises storage requirements to extract my data? For Linux and macOS, the minimum storage should be greater than or equal to the on-disk representation of your largest table (uncompressed). For Windows, the minimum storage should be 2X greater than or equal to the on-disk representation of your largest table (uncompressed). What if there isn't enough disk space on the Db2 Warehouse on Cloud for Analytics landing zone to fit my largest table? You can run `lift df` to check for available disk space on the Db2 Warehouse on Cloud for Analytics landing zone. You can free up space by running `lift rm`. If you still don't have enough space, you can split your table into multiple file chunks and upload those individually using the `lift extract --size` option. I love that Lift is so fast, but can I slow down my upload if I'm on a bandwidth-limited network? Sure. You can use the `lift put --max-throughput` option to limit the throughput utilized by the data transfer. I don't want to keep typing in my database credentials and other common options. Can I set these as environment variables or store someplace to reference? Yes. You can set connection credentials as environment variables. You can also create a properties file, and place your database credentials and common options there. Take a look at `lift help <command ` to see a list of options that the Lift CLI supports. Can I use IBM Lift CLI for data regulated under HIPAA? IBM Lift CLI may be used to process Protected Health Information regulated under HIPAA if Client, as the data controller, determines that the technical and organizational security measures are appropriate to the risks presented by the processing and the nature of the data to be protected. IBM Lift CLI is not designed to process data to which additional regulatory requirements apply. How do I configure Lift CLI to work with an HTTP proxy? For the proxy host use proxy.host=<hostname> . For the proxy port use proxy.port=<port number> . Both must be specified for the settings to take effect. If the proxy requires authentication, the Lift CLI uses basic authentication in the CONNECT request by providing proxy.user=<user> and proxy.password=<password> . Both must be specified for the authentication settings to take effect. How can I add a new X509 certificate to the list of trusted certificates for the Lift CLI? An environment properties file called lift.environment located in the Lift CLI installation bin directory ( <Lift CLI install dir>/bin ) may be created with the following contents to add a X509 certificate to be imported to the trust store. For the proxy host use proxy.certificate.path=<fully qualified path to the X509 certificate file> . Does Lift support General Data Protection Regulation (GDPR) readiness requirements? This document is intended to help you in your preparations for GDPR readiness. It provides information about features of IBM Lift that you can configure, and aspects of the product's use, that you should consider to help your organization with GDPR readiness. This information is not an exhaustive list, due to the many ways that clients can choose and configure features, and the large variety of ways that the product can be used in itself and with third-party applications and systems. Clients are responsible for ensuring their own compliance with various laws and regulations, including the European Union General Data Protection Regulation. Clients are solely responsible for obtaining advice of competent legal counsel as to the identification and interpretation of any relevant laws and regulations that may affect the clients' business and any actions the clients may need to take to comply with such laws and regulations. General Data Protection Regulation (GDPR) has been adopted by the European Union (EU) and applies from May 25, 2018. The following sections provide considerations for configuring IBM Lift to help your organization with GDPR readiness. IBM Lift is a tool that migrates data from a supported on-premises data center (source) to an IBM Cloud data property (target). Most of the configuration to support data privacy is enabled on the source and target data repositories. Follow the guidelines provided by those offerings to ensure the best configurations to meet data privacy requirements. Although the user specifies which data sets are moved by Lift and defines the source and targets, Lift itself is not configurable in a way that affects how the tool moves data. Lift can be used through either the IBM Integrated Analytics System (IIAS) console or Lift CLI. When using Lift CLI, ensure that access to it is controlled. Lift CLI does not save credentials to the source or target systems. However, you can opt to save access credentials to the source or target repositories in a configuration file so that the credentials do not need to be entered explicitly for each Lift command that is issued. If the credentials are saved in a configuration file, access to the file should be properly controlled. Any instance of Lift CLI on a local system might have been used to generate files that were extracted from source systems that contain personal data. When using the IIAS console, the user automatically has access to the source repository and might opt to save access credentials for the target repository. The credentials for the target repository that are saved by the IIAS console are available to anyone who uses the same IIAS user ID and password. This allows someone to send new data or overwrite existing information in the target system. The user ID and password of the target system can also be used to access the target system directly. Access to specific areas of the IIAS source repository can be restricted to different users. Certain functions performed in the IIAS console cause data files from the IIAS source repository to be saved to the local file system. Proper measures to control the access to the directories where these data files are stored is key to ensuring data privacy. Lift is preconfigured to support data security; thus there is no additional configuration required. When using IIAS console, the user can opt to save access credentials to the target system using the IIAS console with Lift. The credentials to the target system are saved securely in a repository within IIAS. The IIAS console credentials are transmitted in encrypted form (token) between components within the on-premises IIAS. The encrypted token is a one-time token with expiration. The token is decrypted with a key that is stored within the IIAS system, and used as credentials to invoke the IIAS REST API. The credentials for the source (IIAS) are securely stored and managed by IIAS backend. The user id and password can be retrieved via the IIAS REST API. No credentials are stored on the client side as browser cookies. The credentials are isolated to the current session, in which the user would be carrying out Lift functions. • Processed lawfully, fairly, and in a transparent manner in relation to individuals. • Collected for specified, explicit, and legitimate purposes. • Adequate, relevant, and limited to what is necessary. • Accurate and, where necessary, kept up to date. Every reasonable step must be taken to ensure that inaccurate personal data is erased or rectified without delay. • Kept in a form that permits identification of the data subject for no longer than necessary. What is the end-to-end process that personal data go through when using our offering? Lift does not collect, process, or store customer personal data. It merely provides a mechanism to move data from supported database sources to selected targets using IBM Aspera for high-speed transport over a wide area network. Safeguards for data privacy can be managed at the source or target repository. Typically, only the client name and email address are used to enable personal replies for the subject of the contact. The use of personal data conforms to the [IBM Online Privacy Statement] ( https://www.ibm.com/privacy/us/en/). Customers are advised not to directly add or upload, to any of these systems, files that contain personal data. When assessing your use IBM Lift and the requirements of GDPR, you should consider the types of personal data which in your circumstances are passing through IBM Lift. Lift itself does not store any customer personal data. The following data storage mechanisms are used by IBM Lift, which users may wish to consider when assessing their GDPR readiness. Depending on the usage, Lift might extract data from the original source repository and store that data in a local temporary staging area. Lift might also migrate data in CSV files which are stored locally. While Lift doesn’t provide any mechanism to encrypt the data at rest, customers can take measures to control access and encrypt data for their local systems. After moving the data to the target using Lift, a temporary landing zone can be used before loading data into the final target destination. During data movement, temporary files might be created in these staging areas both near the source and target. Care should be taken to manage, restrict, or clean up these areas when that data is no longer needed. No other data storage occurs while migrating data using Lift. Although Lift does not store any data, it does provide a means to connect to data sources. After Lift is installed, each user who requires access to it must be authenticated on the local environment. There is no support for finer-grained access control to Lift. A Lift user still requires access credentials for the source data repository. If those credentials are stored in a configuration file, steps must be taken to prevent unauthorized access to that file. Steps must also be taken to prevent unauthorized access to other files on the local system, including those containing data extracted from previous data transfers. The onus is on the customer to ensure that the local environment on which Lift is installed, including temporary storage directories, is not accessible to unauthorized users. Lift uses a 3-step process to migrate data: extract, put, and load. Data extraction is performed from the source data repository (such as IBM PureData System for Analytics (PDA), formerly called Netezza) to a temporary landing zone where Lift is installed. Lift is installed in a local environment that is usually near the source data. The user determines where Lift is installed and what controls are in place to secure this local environment. When data is being moved (put) by Lift and in transit, it is always encrypted using the AES-256 encryption algorithm. (See https://asperasoft.com/technology/transport/fasp/fasp-security-model/ for more information.) Data landing in the IBM Cloud target is staged in a temporary area that is encrypted when the data is at rest. The final step in data movement is the loading of data from the staging area that is associated with the IBM Cloud target into the actual provisioned data repository. IBM Lift does not support deletion of customer data in the source repository. However, Lift can append or replace information in the target repository by overwriting what is there. Lift can also invoke commands to delete temporary files in the landing zones at the target. Otherwise, data stored in temporary staging areas, both at the source and target, should be access controlled, encrypted, and cleaned up if no longer needed. Since these systems are outside the scope of Lift, follow the guidelines provided by those offerings or your own internal controls to ensure the best configurations to meet your data privacy requirements.IBM Cloud target into the actual provisioned data repository. Customers should regularly test, assess, and evaluate the effectiveness of their technical and organizational measures to comply with GDPR. These measures should include ongoing privacy assessments, threat modeling, centralized security logging, and monitoring. Logging capabilities embedded within Lift provide a means to help troubleshoot product issues and record certain usage. The logs generated are stored on the local environment indefinitely and can be sent to IBM to help with problem determination should the customer need assistance. The logs generated are system logs that capture events, commands, error codes, and messages that do not contain any customer data. Lift does not maintain and monitor logs of security events, or support threat detection and investigation activities. Using the facilities summarized in this document, IBM Lift enables a user to restrict usage of any technical data within the platform that is considered personal data. Can the Lift CLI be installed directly on PureData System for Analytics? Yes, the Lift CLI can be installed on the PureData System for Analytics, but additional storage must be attached to provide the extracted data sufficient staging disk space. What are the best practices for attaching and configuring additional storage for PureData System for Analytics? The following tech notes provide steps to mount SAN/NFS systems on PureData Systems for Analytics. They also include best practices for attaching and configuring additional storage for PureData System for Analytics. On what part of my on-premises system should I install the Lift CLI if I'm using IBM PureData System for Analytics sources? When you are installing the Lift CLI for PureData System for Analytics sources, install the Lift CLI on your "injection" system (the system that you use to stage data to load into the PureData System for Analytics database). That system will have good connectivity to the PureData System for Analytics and will have lots of disk space for staging data. However, if your injection system is already fully loaded, then install the Lift CLI on a similar system that is similarly connected and with significant staging disk space. Where should I install the Lift CLI for the best throughput if I'm using IBM PureData System for Analytics as my source? We strongly recommend that you install the Lift CLI on a Linux machine. When your Lift CLI is installed on a Linux machine, data extraction from PureData System for Analytics sources is done with high speed unload facilities. Install your Lift CLI on Linux for significantly better overall throughput when your source is PureData System for Analytics. Where should I install the Lift CLI for the best throughput if I'm using IBM Db2 for Linux UNIX and Windows as my source? We strongly recommend that you install the Lift CLI on a Linux machine with Db2 client installation. Installing Lift CLI on your Linux machine with Db2 client significantly improves overall throughput. When Lift CLI fails to detect Db2 client, different extract strategy is used and you may notice reduced extract throughput. A message on console "Lift is extracting data at sub-light speeds. You can improve extraction time by installing and configuring the Db2 client. For more information, visit http://ibm.biz/BdZcFp, is printed when Db2 client is not available on your machine where Lift CLI is installed. What are the Db2 client requirements to extract my data from IBM Db2 for Linux UNIX and Windows with better performance? 1. db2 (for Linux) or db2cmd (for Windows) command have to be available in PATH. 2. The OS user has to be included in SYSADM group of the Db2 client instance if Lift CLI is run remotely from IBM Db2 for Linux UNIX and Windows server. 3. Version of the Db2 client has to be same or higher than version of IBM Db2 for Linux UNIX and Windows server. Can I migrate table that has hidden columns from Db2 source database? What are the Oracle client requirements to extract my data from an Oracle Server with better performance? Note : You do not need to pre-configure the source database connection from the Oracle client. Can I migrate a table that has international characters that include a multi-byte character set? Yes. Lift CLI uses a UTF-8 code page and supports data conversion from commonly used Oracle character sets. The Oracle client is configured on my Lift CLI machine, but Lift CLI displays a message like "Lift is extracting data at sub-light speeds. The source table contains data types that reduce the speed at which Lift can extract data." Why can't I extract data at faster speeds? Each table is evaluated separately. This degraded mode impacts only the current table extraction operation due to the presence of the affected data types. How do I use SSL to connect Lift CLI to an Oracle server? Use Oracle's "TCP/IP with SSL" protocol, also called TCPS, to establish a connection between Lift CLI and an Oracle server. The procedure for doing this depends on whether you use an Oracle client. If so, Lift CLI must be installed on the same machine as that client. a. Copy the certificate file from Step 1 to a directory on the Oracle client machine. f. Copy the wallet from the Oracle server machine to the Oracle client machine. It is now the client wallet. Do I need to set up Microsoft SQL Server Tools or client to use Lift CLI? No. Lift CLI doesn't need any other additional setup of tools for data migration. When I use the DDL or db2look command, how can I migrate objects that have dependencies? c. A dependent object that was changed by an ALTER statement after objects that depend on it were created. When I use the DDL or db2look command, can I migrate a table that contains an identity column? Yes. However, because the GENERATE ALWAYS definition of the identity column is migrated to the corresponding column of the target table, you will need to alter the target table column to disable GENERATE ALWAYS before loading the data into the target table. When I use the DDL or db2look command to migrate a table, is information related to the tablespace migrated to the target? No, the migrated table at the target uses the tablespace of the target. When I use the DDL or db2look command, how is the table organized (row or column) at the target? The DDL for the target table will have the same ORGANIZE BY clause (row or column) as the source table. When I use the DDL or db2look command, I need to modify some DDL statements. How can I do this? 1. Use "lift ddl --generate" to generate the DDL statements. 2. Modify the generated DDL file as per your requirements. 3. Use "lift ddl --execute" to apply the generated DDLs on the target. 1. Save your modified DDL statements to a filename ending with .ddl extension. 2. Use "lift ddl --execute" to apply your modified DDL statements on the target. I run the DDL or db2look command but it fails with the error message "The user does not have the necessary privileges". How can I fix this problem? The privileges and authorities that are needed to run the DDL or db2look command is described in http://ibm.biz/BdZ5wE. Ask an administrator to grant the necessary privileges and authorities to you and run the command again. After the command has run successfully once, you can relinquish these privileges and authorities without affecting further DDL generation. Connect with a community of people using the Lift CLI to find answers. Need answers? Start here for help from users just like you! Can’t resolve a problem? Get help from IBM support. Log in with your IBMid. Mandatory: In the Service Impacted field, select IBM Lift CLI. Check that you have a recent version of the jarsigner Java program installed. It is included in a Java SDK/JDK. It is not included in a JRE. On Windows: jarsigner -verify -verbose:certs "lift-cli-windows.zip"
- Signed by "CN=IBM Canada Limited, O=IBM Canada Limited, L=Markham, ST=Ontario, C=CA"
The timestamp indicates when the install image was signed. Verify the public key fingerprint of the certificate. The openssl program is required. It is available in Linux and MacOS by default. It is available in Windows 10 using the command line program ( cmd ) or PowerShell in bash mode. a) Unzip the downloaded image file into a directory of your choice. The following two sub-directories are created: META-INF and lift-cli-install . d) Run the following openssl command to show the fingerprint of the public key contained in the certificate.